The problem with central heating is that it relies on a thermostat that will be taking temperature readings from one specific place in the house. This typically leads to overheating smaller rooms if the thermostat is placed in a cold location, or underheating if it’s placed in a well-insulated space. Our energy-efficient electric heaters eliminate these fluctuations by having built-in thermostats, accurate to a fraction of a degree, which carefully maintain your room temperatures. By heating your home on a room-by-room basis, you can maintain a precise heat level for every area of the home, reducing energy waste in spaces you use less often. So, if your spare rooms are empty for long periods of time, you’re under no obligation to heat them to the same extent you’d heat your living room. Electric radiators, such as our bestselling Haverland RC Wave, offer smarter heating that will always fit around your household. To make your zoned heating system as effective as possible, most modern electric radiators come with integrated programmers so you can have your heaters switch on at specific times. With 24/7 programming, you can customise your heating around your daily and weekly routine so your electric radiators only draw energy when absolutely necessary. The benefits of a 24/7 heating schedule aren’t just limited to when you come and go from the house – you can also program your heating to reflect how you use each individual space. While you may want to pre-heat your living room and kitchen so they’re warm the second you step through the door, you may not want to warm your bedroom until an hour before you go to bed. The digital programmers built into radiators like our Ecostrad Ecowärme will help you find more ways to save energy, but more importantly, they offer a level of flexibility that will match any lifestyle. Working in tandem with the precision thermostat and programmer are the electric radiator’s custom temperature settings. Where once electric radiators only offered rudimentary controls, current models give you the option of selecting specific temperatures to find the right level of comfort for your home. Many efficient electric radiators allow the creation of custom ‘comfort’ and ‘economy’ temperatures that can be saved and accessed whenever the need arises. This means you can store a preferred temperature level for when you need comfort above all else, and choose a specific temperature level for when you want to economise. By selecting different temperatures for your heaters at times when your rooms aren’t in use, you can save on your heating even further and reduce energy waste at the same time. While the digital programmer does the lion’s share of the work when it comes to saving energy, most of our electric radiators also offer additional features to help trim down your bills. Typically, the extra features you’ll see are open window detection and adaptive start. Open window detection is fairly self-explanatory: it’s a function that activates when a sharp drop in temperature is detected to prevent you from wasting heat. Adaptive start, on the other hand, is a little less well-known. This handy feature means that your radiators will start to heat ahead of schedule so that your rooms are the right temperature at the right time. As adaptive start uses a more gradual warming process to reach your room’s optimum temperature, your electric radiators use less energy and operate more efficiently. These extra functions aren’t an essential for some but every little bit helps when it comes to saving energy. Electric radiators like our Haverland SmartWave use these additional energy-saving functions to help reduce waste without any effort from the user. They’re the perfect choice for efficient and hassle-free heating. 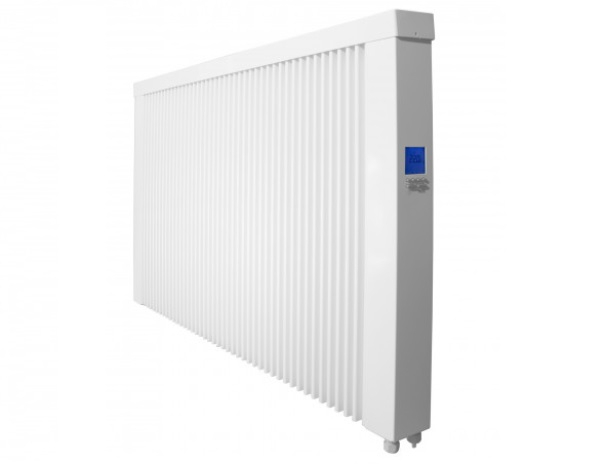 If you’re interested in any of our energy-efficient electric radiators be sure to take a look at our exceptional range. We offer oil-filled radiators, dry element radiators, as well as electric radiators with precision thermostats so you can enjoy the most efficient system possible. Call our friendly sales team on 0330 300 4444 for more information or for a free, no obligation quote tailored to your property.